Grosseto is a larger city in the south of Tuscany with around 80,000 inhabitants almost by the sea. The city is the capital of the Maremma region, which is famous for its nature. 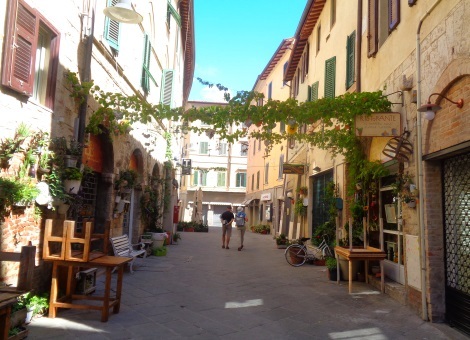 Grosseto itself offers tourists an old town with a cathedral and a preserved city wall. The district Marina di Grosseto, about 8 km from the city centre, is situated at the sea and is popular among bathers. Practically all the sights of the city are in the rather small old town surrounded by a great city wall. The wall of Grosseto is almost completely preserved, it is probably the biggest monument of Grosseto. The cathedral is, as in most Tuscan cities, the central building of the old town. 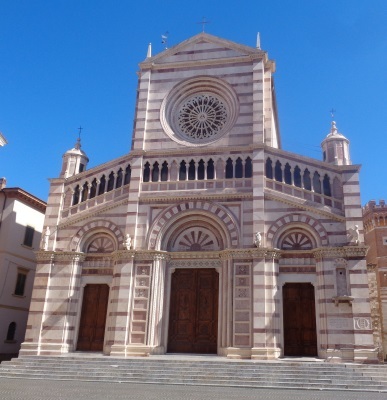 Like most large churches in Tuscany, the Cathedral of Grosseto has a two-tone façade, light beige and dark brown. The façade, however, is not made of marble, as is the case with the large churches of Tuscany (Florence Cathedral, Pisa Cathedral, etc. ), but of limestone. You can also enter the Grosseto Cathedral and look inside. Mostly open east in the morning, in the afternoon we stood twice in front of closed doors. Even today, the city occupation still goes around almost the whole city. There are 6 city gates in Grosseto between the gates is the wall. On the wall trees were planted, there is a path on top of the city wall (see picture). 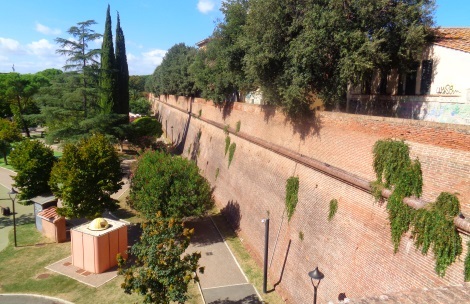 The entire Grosseto city wall reminds many Tuscany connoisseurs of the wall of Lucca, an even longer, completely preserved city fortification, about 100 km further north in Tuscany. But the wall in Grosseto is much shorter, because the old town is much smaller. In half an hour it is easy to walk the whole way. 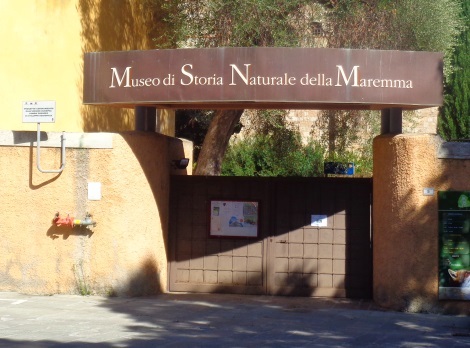 There are several museums in Grosseto, the Natural History Museum of the Maremma region is worth a visit. 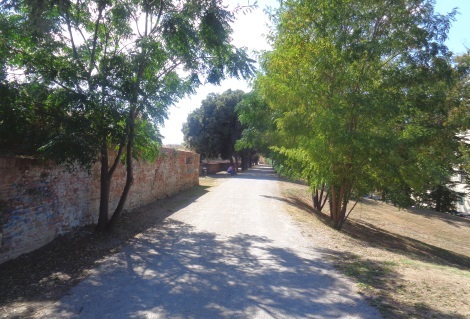 Maremma is famous for its nature and nature reserves. In the museum you can see landscapes from the region and the animals of the region. There is also a room dedicated to stones, geology and the like. There is also a room about the early human history (Stone Age) in the area in the Nature-Museum in Grosseto. Opening hours: Tue vis Fr in the morning, weekend some hours in the late afternoon / early evening, Monday no opening times. Admission: 5 euros for adults. Main route: The city is located on the railway line from Rome via Grosseto to Livorno, Pisa, La Spezia and Genoa. In both directions (Rome and La Spezia) there is an fast IC train from Grosseto about every 2 hours. The journey time between Grosseto and Rome is less than 2 hours. There are also many regional trains to Follonica or San Vincenzo. Grosseto is located in southern Tuscany, not far from the Mediterranean Sea. To Elba: By changing trains at Campiglia Marittima, you can get from Grosseto to Piombino Marittima, the ferry port to the island of Elba, several times a day. To Siena: There are about 7 trains a day from Grosseto to Siena on a branch line of the Italian railway. This railway line is considered to be the most beautiful in Tuscany (ticket costs 9.90 euros in summer 2018). To Florence: From Grosseto you take the railway along the sea to the north and change in Pisa to Florence. The journey time by train via Siena to Florence is longer.